What Chameleon Care Supplies Do You Need? Is a chameleon the right pet for you? In the market for the best chameleon setup but you don’t know what product to choose? After carefully examining the market, Dr. Fox has concluded that the ReptiBreeze LED Deluxe by Zoo Med is the best model out there. In fact, this unit is considered the ideal habitat for chameleons due to the fact that it is an open-air, screen enclosure that allows for ample air circulation. Moreover, because it was constructed using an aluminum rust resisting frame, the unit is quite durable. Also, the product also has a removable bottom part where the substrate can be held. 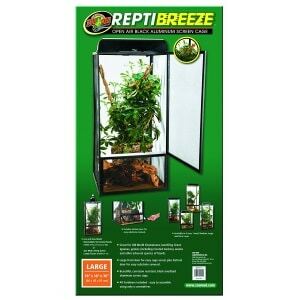 If the ReptiBreeze LED Deluxe by Zoo Med is out of stock, please consider the Zoo Med ReptiBreeze 18 x 18 x 36, as it is a solid second option. If you are on the lookout for a large habitat for your chameleon, you can’t go wrong with this quality pick. It comes with white and red LED lights, as well as a clear acrylic door panel to observe the pet at any time. The LED lights do not remember the preferred user setting when the power is switched, and both the white and red lights get turned on simultaneously which can be upsetting. For people that want a high-quality habitat for their chameleon, the ReptiBreeze LED Deluxe is easy to assemble and comes with all the hardware included so that the owners can customize and make the most out of their purchase. This is a multi-purpose choice that can be used for old world chameleons, hatchling green iguanas, geckos, anoles, and other arboreal species of lizards. The screen cage is built from corrosion-resistant aluminum. Customers reported that since the base is made using plastic on the bottom, it seems a bit flimsy and unable to support the combined weight of sand and several potted plants. The Zoo Med alternative is a dependable unit that is built to give your pet a comfortable and secure home. The open-air screen cage makes it easy for the owners to have quick access to their silent companion. This glass terrarium is built to house small species of reptiles or amphibians. The patented front window ventilation will ensure that your pet gets all the air needed for a healthy growth without the risk of it escaping. Do keep in mind that this is a small terrarium which means that you should not use it as a home for large chameleons as they will lack the required space and not feel comfortable in it. 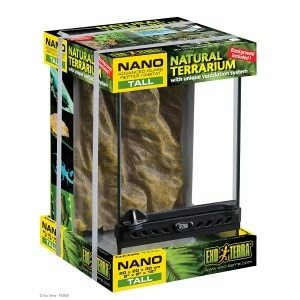 If you are on a tight budget but you are resolute on getting a product that can offer great value for the money, the Exo Terra terrarium is capable of housing all your small reptiles and amphibians in a lush environment. 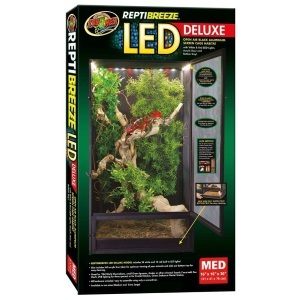 If you are searching for a large, comfortable habitat for your beloved chameleon, the ReptiBreeze LED Deluxe might be just the product for you. One of the most important features that this model has is its aluminum frame that makes it durable and sturdy. What is more, the unit has two front doors that supply you with easy access and enough space to do the cleaning. Another highly appreciated feature of the deluxe model is the fact that the model has a clear acrylic door panel that enables the owner to see the pet at all times. Moreover, in order to make cleaning easier, the product features a removable bottom tray where the pet’s owner can place the substrate. This way, any excess moisture can be easily removed. What is more, all chameleon owners that want to make sure that their pet’s habitat is well illuminated should know that this product features touch-activated LED lights that allow for three different settings. 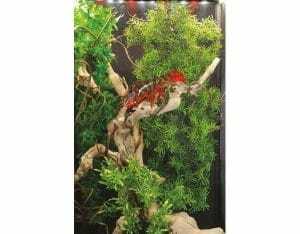 Another model that chameleon lovers might like is the Zoo Med ReptiBreeze 18 x 18 x 36. This unit is particularly fitted for small sized animals and, as a result, ideal for a variety of types of chameleons. Because the manufacturer aims to offer its buyers a dependable item, it is worth knowing that this habitat is corrosion-resistant and is made from black anodized aluminum, reason why the cage assures security and durability. Also, this open-air screen cage comes fitted with a large front door that makes access to the pet effortless. Moreover, in order to aid the user to clean the habitat, the product also comes fitted with a bottom door that the pet owner can use to remove the substrate. When shipped, the product is not assembled. However, as current users point out, the unit contains all the needed hardware and is said to be easy to put together by just using a screwdriver. Another small-sized model that is worthy of your time and money is the Exo Terra Glass 8 x 8 x 12. Among the most cherished features of the model are its front opening doors that supply the user with easy access for maintenance and feeding. As a plus, once closed, the doors are safe, as a custom-made lock will prevent the animal from escaping. However, when needed, the doors can be opened separately. Besides, in order to make the access to the habitat even easier, the manufacturer has created the product so that it features a removable stainless steel cover. Thus, by removing it, one can gain effortless access to the cage so that she/he can clean and/or decorate it without any hassle! Furthermore, the product has a waterproof base and a raised bottom frame that ensures that there is enough space for the installation/mounting of a substrate heater or heat cable. 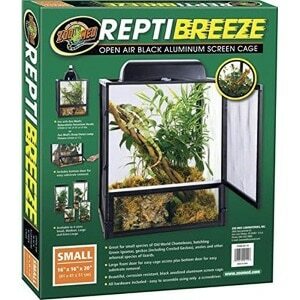 For those who are looking for a smaller sized habitat, the Zoo Med ReptiBreeze 16 x 16 x 20 could be of interest. As users have noted, the product is lightweight and easy to clean. 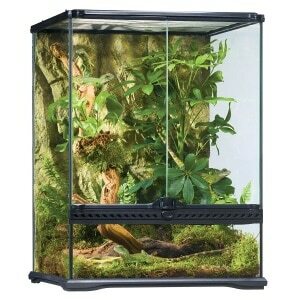 Moreover, as one happy buyer has stated, this unit is the perfect size to accommodate a baby chameleon. Thus, you can settle for this model then move up to the one for young adults once your beloved pet is all grown up! Although the product has to be assembled by the buyer, current users of the device say that the model is shipped with all the needed parts and that they are effortless to put together. Similarly to the previous product made by the same manufacturer, this is an open-air aluminum screen cage that was designed to have two doors for easy access. However, one aspect that you should be aware of in regards to this model is the fact that the model has no hooks or braces that can be used as a way to hang vegetation from. Last but not least, we couldn’t have ended this selection without mentioning the Exo Terra Rainforest Habitat. According to its manufacturer, this kit comes shipped with all the parts needed to give your terrarium hobby a successful start. As a plus, you should know that this unit has been uniquely designed by European herpetologists. Additionally, this model comes fitted with a handful of useful features such as the dual front doors for an escape free access and a full metal screen for top ventilation. Furthermore, the product contains a compact top lighting system so that reptile users can easily set up additional UVB lamps. Besides, as a way of making this habitat ideal for your pet, the manufacturer includes all necessary decoration items. This way, your beloved chameleon will surely be able to enjoy a cozy, homely environment. Even more to this point, the natural-looking rock terrarium background can be quickly modified/ changed if the owner feels like it. Still looking for a good setup for chameleon, for sale but you find it difficult to navigate through all the information the internet has to offer? Because we are well aware of just how difficult the task of finding the best cage for chameleon can be, we have done the research for you, and we have ended up with a list of must-have features that you should have your eyes on when shopping in this line of products. So, don’t waste any more time; read ahead and make your choice accordingly! Before making any rash decisions, it is advisable that you take the time to consider your and your pet’s needs, this way, you’ll surely be able to end up with the best chameleon cage setup. Therefore, it would be best if, before placing that order, you thought about just how large the habitat should be. 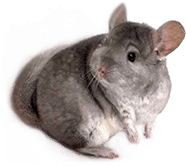 This decision should be taken after assessing aspects such as the pet’s age and dimensions as well as just how much space you currently have available for the setup. For example, if you are the proud owner of a baby chameleon, the size of the chosen habitat should stick between the following measurements: 16 x 16 x 20 or even 8 x 8 x 12. However, if your pet has reached its adult stage, larger models should be favored. In order to end up with a practical product, another feature that should be checked in advance is the product’s easiness to clean. As chameleon setup reviews often point out, a model that comes fitted with large doors, as well as a removable bottom trays, should be south after. Similarly, models that are made from an easy to clean material are more reliable and practical than the alternatives. Moreover, one key feature that is a must in all chameleon cages is the product’s ability to accommodate additional lighting bulbs. Because chameleons can only absorb vitamin D through UVB lighting, it is crucial that the chosen model can easily support the installment of a heat lamp as well as that of a UVB lamp. Even more so, it is important that one knows for sure whether or not the product that they like allows for water drainage, as this feature is a must in cages that also contain plants. When it comes to caring for a chameleon, all owners should keep in mind that there are a few golden rules that should not be broken. 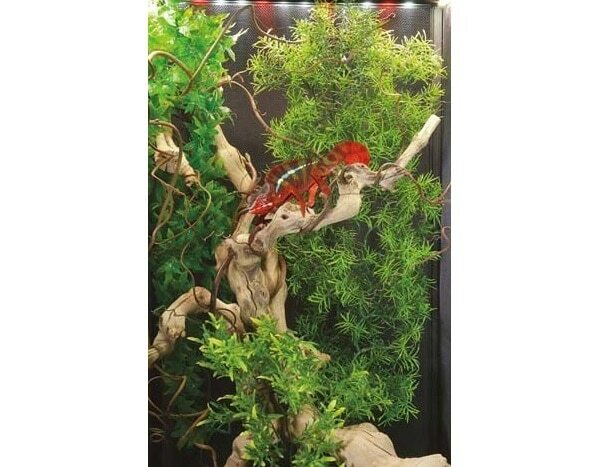 For example, although it is advisable to decorate the new chameleon cage in order to make it cozier for the pet, you should not purchase plants that are in any way toxic. To avoid doing so, you should stick to plants such as Hibiscus, Ficus or Schefflera, as they have been already deemed `appropriate`. Also, when decorating the habitat, specialists suggest that you use both vertical and horizontal branches that vary in diameter. By doing so, the setup will look well put together and, most importantly, it will be comfortable for the pet.